"Will there be flowers and sunshine where I am going? ", she asks me. I tell her that I'm not sure..."it depends on where you are going." I reassure her that no matter where it will be she is sure to love it when she gets there. "Can you make me a pretty dress for my journey? Something filled with the color of a flower I love and something filled with sunshine and summer." "What is the flower that you love? ", I ask. So, I made her a yellow polka-dotted dress filled with flowers and sunshine. 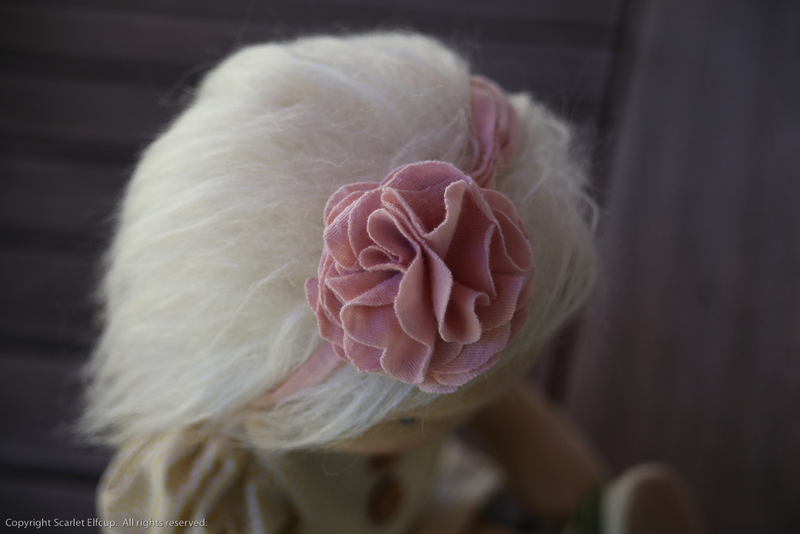 And for her lovely hair I made her a peony...in pink. "How about shoes, mum? Can you make me something with more flowers. Make them really comfortable because it might be a long journey and my soft feet will need comfort." "Darling, I can make the most comfortable and pretty shoes for you to travel in. How about wool felt slip-on shoes with a yellow peony and an infinity stem?" "I like," she says so simply. "Are you nervous?...about your journey? ", I ask her. She doesn't respond. She just looks out into the world lost in thought. You see, our little Emma is not so much of the worldly type. She's a bit of a homebody. What she loves most is flowers in her garden. When she's not in her garden, she's in our library pouring over books about flowers and other things of the natural world. As to be expected of all young children this age, when she loves something, she really loves something...almost an obsession really. "Mum......one more thing....can you make me flowers to carry along on my journey? I'd like to bring them...as a gift and as a piece of memory for me." How sad that made me feel to hear those words...a hint of departure...the bitter sweet emotion of a child leaving home, especially one who has never gone into the world. But, as all parents must do...we let them go so that they may grow and learn and discover all the beauty that is theirs to enjoy and experience. And so, I made her one last request....a lovely bouquet of flowers in a basket. These are flowers for Emma. 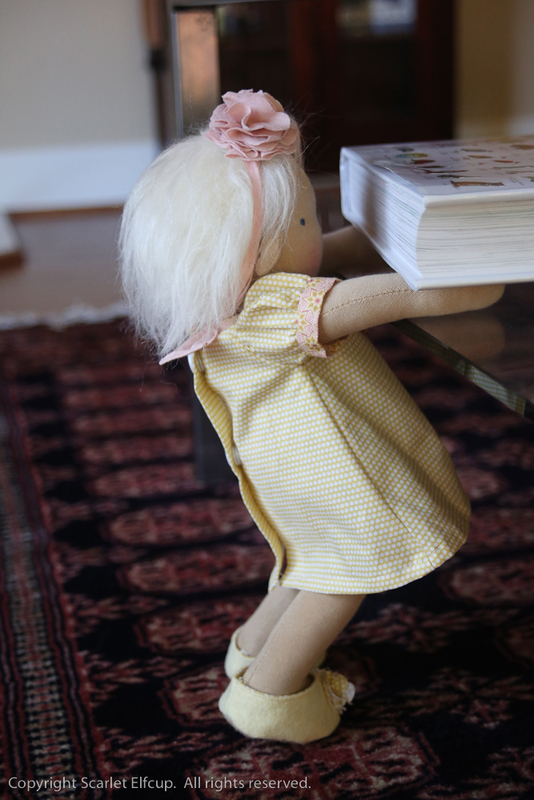 Emma is a 14" doll, made with natural materials and one-of-a-kind. She is made with premium quality cotton jersey imported from the Netherlands and firmly stuffed with bio-wool. Her seams are sewn twice for reinforcement. 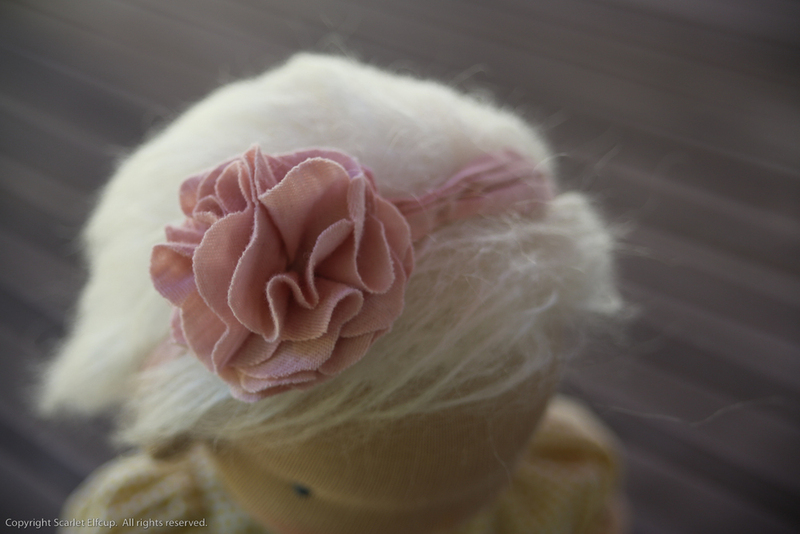 Her hair is made of wispy natural mohair yarn. She has an embroidered and simple, expressionless face. Her cheeks and nose are blushed with red beeswax. She is a sitting doll with sewn joints that are made flexible for easy movement and changing of clothes. She has a sweet belly button and cute little ears. She comes wearing a cotton dress that opens and closes fully on the back with snap-on buttons. The dress collar is lined with bias and her sleeves are cuffed and puffed. There are two decorative wooden flower buttons sewn onto the front of her dress. She has on lovely yellow wool felt shoes lined with printed cotton fabric that matches her dress. There is an adorable french poufed flower, stem and leaf design on the shoes. Her headband is made of a light cotton twill. Attached to it is a french poufed flower made of cotton knit. 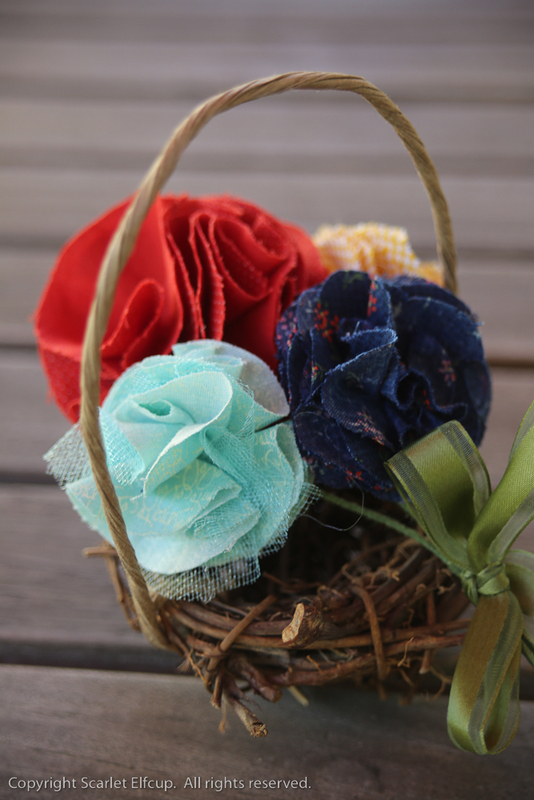 Her flower bouquet is made of a variety of cotton fabrics. The stems are made of floral wire glued in place by a piece of wool felt. Her bouquet is tied with a beautiful moss green ribbon and comes with a basket made with dried twigs and floral wire wrapped in paper for the handle. Please note that the bouquet is not a toy. It is made of floral wire that is not covered on the ends. It is meant as decoration only and advised to be treated as such. Emma is recommended for ages 5+ due to the delicate nature of her design and the small parts on her. 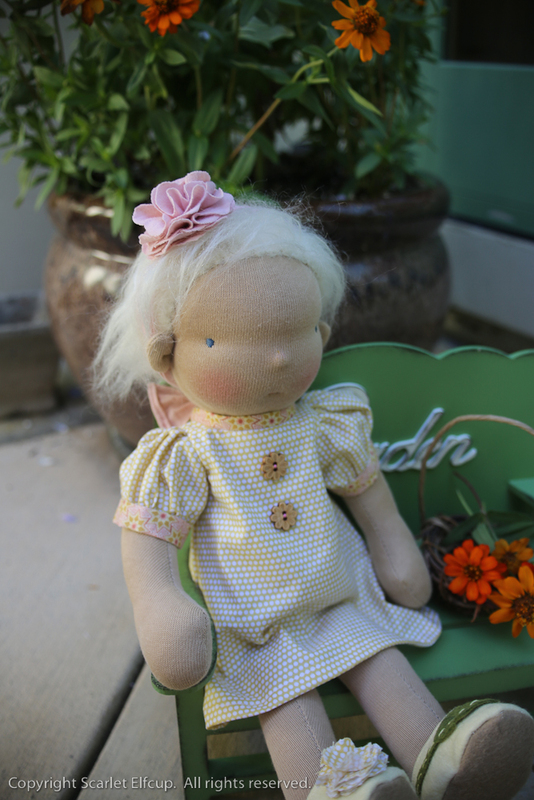 If you are interested in bringing Emma home and giving her a warm and nurturing environment by which she can enjoy flower gardens and books, she is now available for purchase through the Etsy shop. If you are interested in purchasing Emma via the website, please complete and submit the form below. Her price is $165 USD. Purchases made through Scarlet Elfcup's website will be invoiced by PayPal and shipping fees will be waived. Payment should be paid and cleared within 3 days of purchase. Form has been deleted. Emma has found a very loving home to go to. Thank you.